Despite being a relegation match with everything on the line, Wolfsburg vs Holstein Kiel was a wide-open match in which both sides attempted to play attacking football. It was a wide-open affair, to begin with, as both sides quickly played through midfield looking to gain a quick advantage. In the back and forward that quickly ensued Wolfsburg were the side to achieve the first breakthrough. Josip Brekalo slalomed through Kiel’s defensive line and passed the ball low across the ball mouth to Renato Steffen, who redirected the ball on to the goal where Kiel keeper Kenneth Kronholm could not hang on to the ball, Divock Origi stood where a striker is supposed to stand and shuffled the ball into the net to make it 1-0 for die Wölfe. Wolfsburg, however, failed to score that second goal and instead it was Kiel, who would score next. In the 34th minute, Dominick Drexler received a ball on the left wing and broke all the way through to the byline. Keeping the ball on his foot, Drexler cut through Wolfsburg’s defence into the six-yard box and then passed the ball to Kingsley Schindler in the centre, who simply had to tap home the low cross to make it 1-1. The sting continued to be in the match right from the getgo of the second half with either side looking to add to the overall goal tally. In the 56th minute, it was Wolfsburg to add to the scoreline. Origi received a ball ten yards out of the area, shielding the ball he managed to turn and spotted Yunus Malli in the area, who successfully cut right through two defenders and then rounded Krohnholm to make it 3-1. That third goal gave Wolfsburg the confidence to finally put their stamp on the match. Die Wölfe now dominated and had the majority of possession and were pressing to get that fourth goal that would seal the deal for the Bundesliga side. Kiel, in the meantime, struggled to get back into the match but in the 72nd minute should have pulled one back with Alexander Mühling failing to capitalise after being left wide open, his shot, however, just about missed Koen Casteels goal. Mühling may have missed his opportunity, but Kiel were all of a sudden back in the match attacking Wolfsburg in the hope to cut down the lead ahead of the second leg. Die Störche also had chances in the 82nd Marvin Ducksch missed the goal from just a few yards out, and in the 85th it was Aaron Seydel, who squandered an opportunity after being left wide open in the area. With just five minutes left Holstein laid Wolfsburg’s area under siege and should have probably been awarded a penalty after Rafael Czichos was flattened by Maxi Arnold inside the area but referee Deniz Aytekin decided on no call. As a result, the match ended 3-1 giving Wolfsburg the decisive advantage ahead of the second leg, which will take place on Monday. 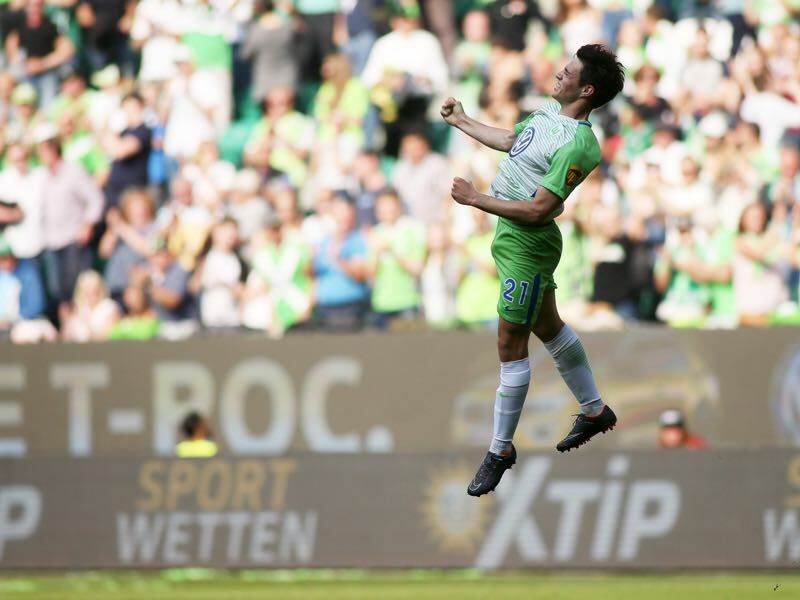 The Croatian winger was fantastic for Wolfsburg. A constant threat for Kiel’s backline Brekalo’s speed was at times breathless, and the winger used it to great effect to score a goal and play two key passes that would eventually lead to goals. 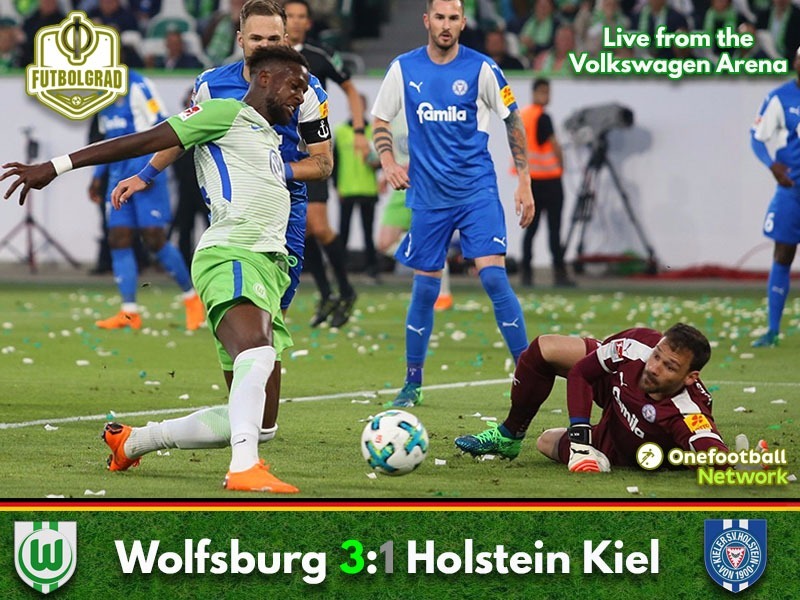 Wolfsburg have the decisive lead going into the second leg mostly thanks to Kiel’s inability to cut down the lead down. Die Störche laid siege to Wolfsburg’s goal in the last 20 minutes but lacked the quality to achieve the breakthrough. In the end, the result will likely cost them promotion to the top flight. Koen Casteels becomes the first-ever player to win five Bundesliga relegation matches. For the first time since the reintroduction in 2009 a first half of a Bundesliga relegation match has produced three goals. Holstein have won more than twice as many league games (14) as Wolfsburg (6) in 2017/18.